The Wharton Administration lost the ball in the sun. 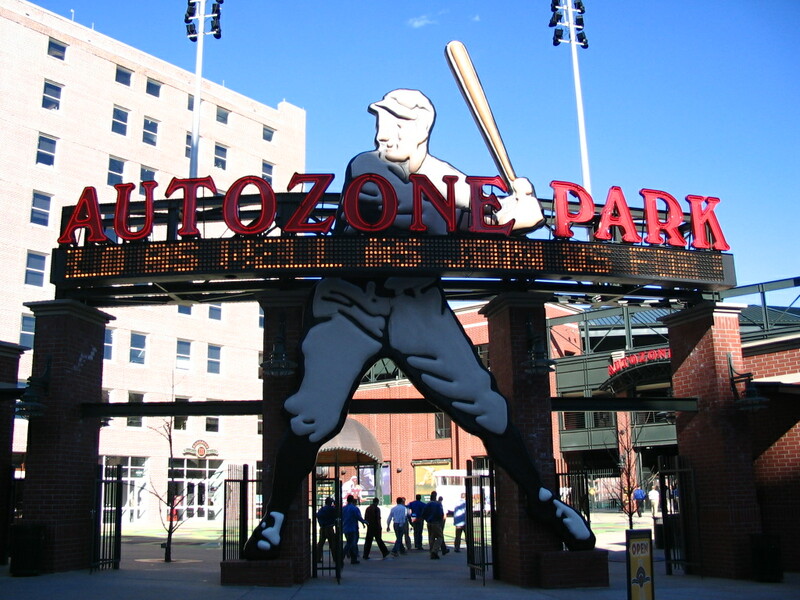 The whole AutoZone Park affair has shades of the baseball poem, Casey at bat. An idea, a solution for a downtown gem, that should by all rights, be a home run for a city that is trying desperately to keep the momentum going on its effort to revitalize the area. But a series of missteps and miscalculations sent two pitches past the Wharton Administration. These missed opportunities could sink the whole deal, and deliver a serious blow to an administration that has had difficulty articulating a coherent long-term vision for the city. Monday is the third pitch, and the question is, will “Casey” be able to deliver, or will the air be the only thing shattered by the force of Casey’s blow…like the penultimate stanza of the classic baseball poem. We’ve known since 2009 that the Redbirds were in dire financial straits. The team has never made money, and defaulted on its bond payments that year, which is what brought Global Spectrum into the picture in the first place. In 2010 the private equity firm Fundamental Advisors bought the outstanding bonds for less than .40 cents on the dollar. That discount, reflected the uncertainty surrounding the financial management of the Redbirds and the previous year’s default. The point is…the problems at 3rd and Union have been known for some time, so it should come as no surprise that we are where we are. Which is what makes the rest of the story so puzzling. In April, we heard the first details of the deal that is currently before the Council. At the beginning of November we found out the city was close to closing a deal pending Council approval. Then just two weeks later, a well publicized invitation only rally, that excluded members of the City Council was held…a move that left some on the Council publicly puzzled…and likely privately annoyed. The snub could have been managed, but questions raised by incoming Council Chairman Jim Strickland…which were still unanswered by Nov. 27th…just six days before the Council would be asked to decide…were never really answered. And so, with an 0-2 count, the Council delayed the vote until Monday, Dec. 9th. Whether or not this becomes the hone run the administration…and all the fans of Mudville…are hoping for is largely up to them. But if it fails, the failure will rest not on the Council, but the Administration, for poor communication, and even worse politics. It seems like we’ve heard this story before. The administration comes before the City Council at the last minute with details on a well publicized deal that seems to blindside the body. Some of this is overblown (Crosstown, for instance, has been about $15m for a long time…though the details of the financing may not have been as well known), but stretching back since the beginning of the Wharton Administration, this has been the norm. You might have thought something would change after the most recent budget battle in June. That was more mess than anyone should want to put themselves in. But much like that deal, in this deal the administration came across as looking inept at gaining consensus on a deal that should by all rights be a home run. Now, at the end of the second year of Mayor Wharton’s first full term, his agenda seems to have fallen into a randomized piecemeal approach, with no articulated long-term plan…much less a destination. The turbulence the last two years have brought on has also shaken confidence in the Mayor. The biggest structural challenges for the city…poverty, unemployment, and crime are further hampered by a declining revenue base as huge swaths of the city remain underdeveloped due to decades of physical expansion without much population growth. None of these issues are getting the focus they deserve from City Hall. And to a certain degree, you saw that in the recent referendum on a sales tax hike to fund pre-k education. The small disorganized opposition didn’t oppose Pre-K, but the lack of movement on the issues impacting the population beyond 3-4 year olds. Certainly, creating more opportunities for them would help those same 3-4 year olds…and might even increase support for generating the revenue necessary to fund Pre-K.
From the outside looking in, it seems more like the battles are picking the Mayor rather than the other way around. On a couple of levels, it feels like the Administration is getting played on the premium they’re being asked to pay for the ballpark. Fundamental Advisors paid .38 on the dollar for the bonds in 2010. The City is expected to pay about the same amount for them before the auction next year. Has anyone asked what the bonds would go for if they actually went to auction? Would Fundamental Advisors be able to turn a profit on them? It doesn’t seem likely. If the bond holder thought they would, they wouldn’t be willing to sell for the same price they bought. But letting the bonds go to auction would put a major attraction downtown at risk. A risk I don’t think the city is willing to take. Nor should they. So while this may all seem like a bad idea that saps away money that might be put to better use, in the end, I don’t think its a bad deal. Its just a deal that has been presented badly…and I tend to agree with the Commercial Appeal editorial that says the City Council should be irritated about it. We’ll see what happens tomorrow. I won’t make any predictions. But I will say, that if this administration wants to get more done in the city, they need to get some messaging together other than waiting until the last second to stir a panic and then get a deal done. That’s no way to run a city, plan for the future, or keep your gig in Oct. of 2015. Tom Guleff liked this on Facebook.